The benchmark VN-Index rebounded on June 23 after two declining sessions on the recovery of several key stocks. On the HCM Stock Exchange, the VN-Index was up 0.35 percent to close at 769.01 points, expanding the market’s growth to 1 percent for the week. Bank stocks, which were the market engine in the past rally, saw divergence. The two of the three largest listed lenders – Vietinbank (CTG) and BIDV (BID) – recouped 0.3 percent each. Vietcombank (VCB) closed unchanged while three other listed banks slipped between 0.7-1.9 percent. On the positive side, some large-cap stocks gained valued and supported the market. Petrolimex (PLX) rose for five days in a row, up 2.7 percent on June 23 at VND71,400 ($3.15) a share, gaining 13.6 percent. Vinamilk (VNM), brewery Sabeco (SAB), budget airline Vietjet (VJC) and insurer Bao Viet Holdings (BVH), in the top 10 largest shares by market value on HCM City’s bourse, also increased. “As the leading bank shares are under profit-taking pressure while the second-quarter business results are not available, the market lacks supportive information,” market analysts at Vietnam Investment Securities Co (IVS) wrote in a note. IVS’s analysts have suggested investors focus on potential stocks rather than on the VN-Index, as though the market index is moving in a narrow range, strong money inflows would continue to boost many stocks. Overall market condition was positive with 162 stocks advancing, 119 declining and 54 ending flat. Almost 255 million shares worth VND4.7 trillion ($27 million) were traded in the HCM City market, up 13.4 percent in volume and 4.4 percent in value compared to the June 22 figures. 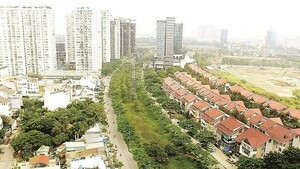 Money continued to flow into small- and mid-cap stocks, particularly real estate shares such as Hoang Quan Consulting-Trading-Service Real Estate (HQC), FLC Group (FLC), Dat Xanh Real Estate Service & Construction (DXG) and Saigon Thuong Tin Real Estate (SCR) with each having several million shares exchanged. 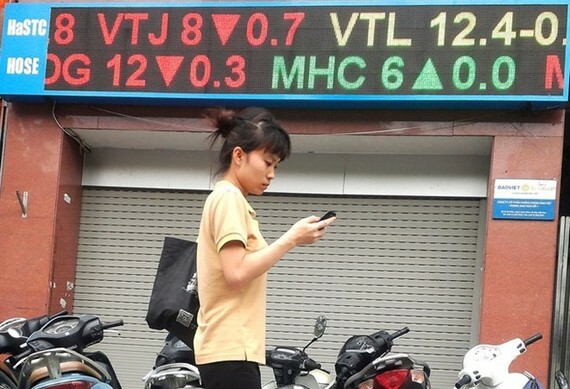 On the Hanoi Stock Exchange, the HNX-Index slipped for a third day, down 0.34 percent at 98.27 points. Nearly 48.6 million shares worth VND623.6 billion ($27.5 million) were traded on the northern market. Foreign investors concluded as net buyers on the two exchanges, picking up shares worth a combined VND136 billion.